This may have been accurate at 7:59 p.m. But from 8 o’clock on, what Neil Gorsuch was and is and will be is a partisan stooge. The only line on his resume that means anything today is that he is the Republican president’s nominee for a seat that opened under a Democratic president. 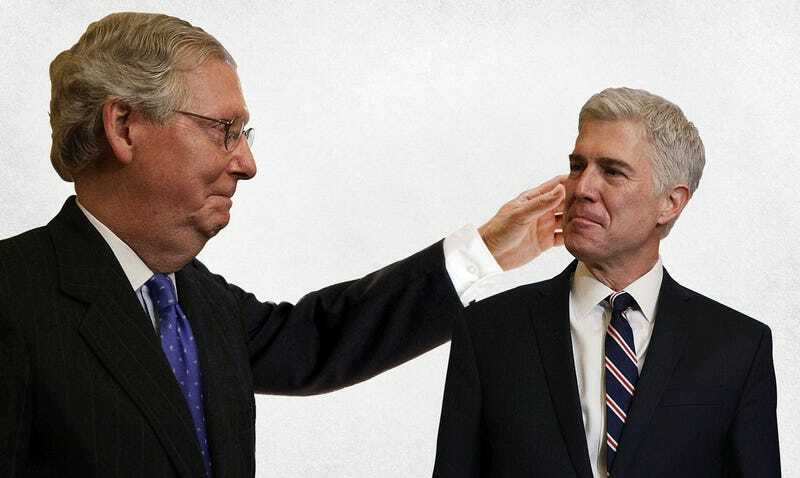 The specifics of that nominee’s record stopped mattering on March 16 of last year, when Senate majority leader Mitch McConnell announced that his party would block Merrick Garland, President Barack Obama’s Supreme Court nominee, from receiving a confirmation hearing at all. Originally, the Senate Republicans tried to frame the obstruction as an election-year necessity—arguing that though Obama had been elected for a four-year term, his constitutional power to nominate a justice had expired after three, and that the nomination rightly belonged to whomever the American public would choose in November. By the end of October, though, Republican Senators ranging from right-wing fanatic Ted Cruz to respectable statesman John McCain were discussing, in the event of a Hillary Clinton presidency, a four-year blockade on the vacant seat. That is, the Republican Party declared that no Democratic president’s nominee could occupy the seat. In place of the constitutional arrangement where the president names a justice and the Senate reviews that nomination, the Senate majority was denying the president the power to even put a candidate forward. They would make a partisan appointment or no appointment at all. Neil Gorsuch has stepped forward to be that partisan appointment. If he is placed on the Supreme Court, then the Court, as an institution, will exist only as an expression of a political power balance between parties—not a judiciary body, but an unelected legislature, run by a Republican majority. This has been the subtext of Supreme Court politics ever since the 5-4 split in Bush v. Gore, when five Republican appointees backed the Republican presidential candidate’s case while Democratic appointees and older Republican picks backed the Democrat. But until last year, it was still mostly a subtext, and people were embarrassed about it. Thus we got to see Chief Justice John Roberts, personally trained as a straight-line conservative activist, occasionally following the indecisive Anthony Kennedy leftward to make a six-judge majority, rather than letting himself be trapped with an unseemly losing hard-right bloc. On National Federation of Independent Business v. Sebelius, he even swung past Kennedy to be the saving vote for Obama’s Affordable Care Act, rather than seeing it knocked down on a 5-4 party-line vote. But the death of Antonin Scalia ruined the polite dynamics. The right wing of the court was suddenly down from four and a half members to three and a half. If the president were allowed to use his constitutional powers to nominate a justice, it would no longer be possible to quietly nudge decisions rightward. So McConnell and the Senate took matters into their own hands. While the Chief Justice maintained a cowardly silence, the Senate Republicans laid down the new rules that would make Roberts their majority leader on a party-line court. Last night, Gorsuch stepped forward to play by their new rules. Senate Democrats, still in denial, appear to be wobbling about how to respond, and McConnell is pressing his advantage, smarmily invoking the notions of deference and cooperation that applied to judicial nominees before 2016. Some Democrats seem to be dumb and weak enough to listen to him. Wouldn’t blocking Gorsuch, after all, be the same thing they objected to the Republicans doing to Garland? But politics and history are not algebra. You can’t flip the sequence of events and put the thing that came after ahead of the thing that came before, because the thing that came before already happened, and it changed the situation. The supposed case for seating Neil Gorsuch—that he is a well-regarded judge with credentials previously approved by both parties—is exactly the actual case for seating Merrick Garland. It cannot, therefore, be used as the case for seating Neil Gorsuch in the seat that Merrick Garland was blocked from taking. Hypocrisy, like time, flows only one way here. The issue last year was whether a fully qualified judge would be given a hearing and a vote to occupy a vacancy on the Supreme Court. The Republicans chose to answer no. The question now is whether a different judge may be given a hearing and a vote to occupy that same seat—when the vacancy is no longer one created by the death or retirement of a justice, but one created by the Republicans, openly seeking a Republican appointee. At this point, the Democrats’ reservations about protecting the integrity of the system are fantasies. The system has already been broken. A respectful retreat to the rules that were in place in 2015 would be meaningless and futile. The excuse for not launching a counter-filibuster against Gorsuch is that it would simply lead the Republicans to turn to the much-discussed “nuclear option,” forcing him through on a simple majority vote, and removing the filibuster as a defense against some theoretical future nominee who is visibly unqualified or extremist. But if the Republicans are willing to kill the filibuster today, they would be willing to kill the filibuster next time around, and to force through an extremist on a narrow majority vote. That is how the Republican Party plays Supreme Court politics now. And Gorsuch is a loyal Republican operative. If he were the neutral, bipartisan, sterling judge he’s supposed to be, he would never have accepted Trump’s invitation to usurp another neutral, bipartisan, sterling judge. He had a rare chance to defend principle and the Constitution, and he refused it. So Neil Gorsuch cannot take Merrick Garland’s place. He can take a lesser seat, on a lesser Supreme Court, as the illegitimate final agent of an illegitimate process. If he deserves to be on the Court, he deserves to be on the court by a 52-48 party-line vote, held over the ruins of the filibuster. Every decision he signs will come with an “(R)” next to his name. That’s the job he chose, and that’s the job he’ll get. Correction: This post originally misdescribed the split in Bush v. Gore as five Republican appointees against four Democratic appointees. Five Republican appointees made up the majority, but two of the four justices in the dissent were appointees of Republican presidents.